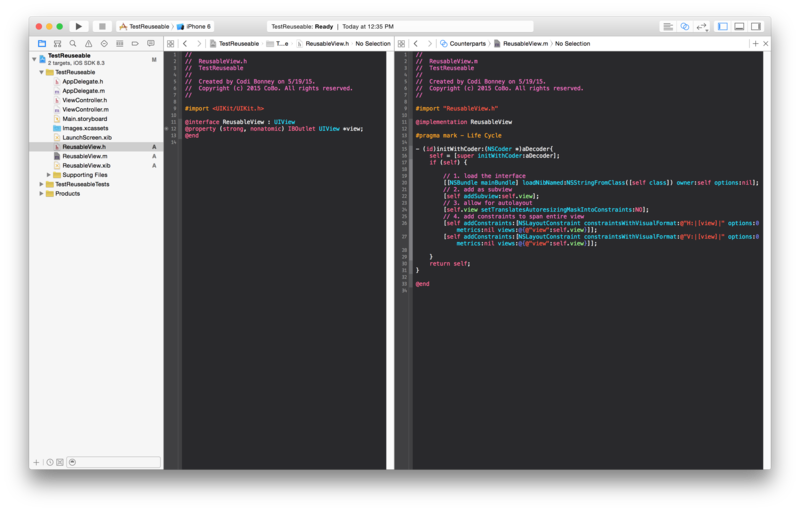 I typically like to create and design my uiviews in interface builder. Sometimes I need to create a single view in a xib that can be reused in multiple view controllers in a storyboard. Reuse and render a xib in a storyboard. set custom class to 'DesignableXibView' in the Identity Inspector. Note: Do not set the custom class of the view on the xib. Only the File Owner! wait a sec ... BOOM!! set custom class to 'ReusableView' in the Identity Inspector. 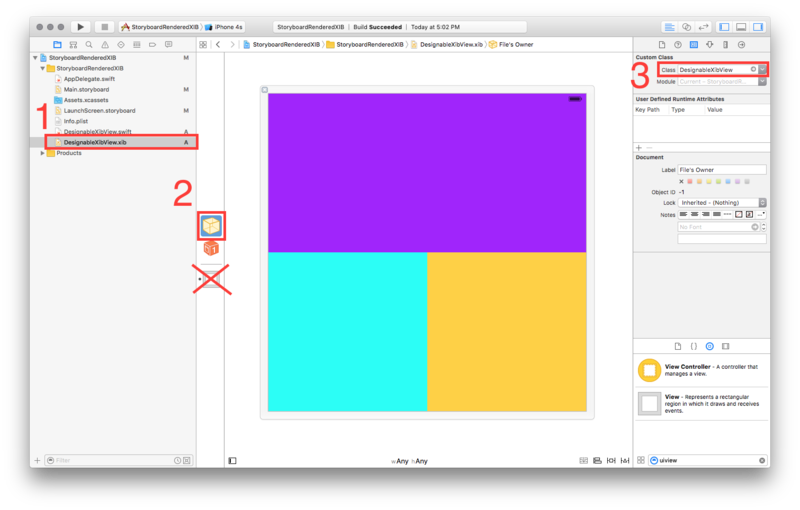 Add initWithCoder implementation to load view and add as a subview. Select the "DesignableXibView.xib" > "File's Owner" > set "Custom Class" to 'DesignableXibView' in the Identity Inspector. Here's the answer you've wanted all along. You can just create your CustomView class, have the master instance of it in a xib with all the subviews and outlets. Then you can apply that class to any instances in your storyboards or other xibs. No need to fiddle with File's Owner, or connect outlets to a proxy or modify the xib in a peculiar way, or add an instance of your custom view as a subview of itself. 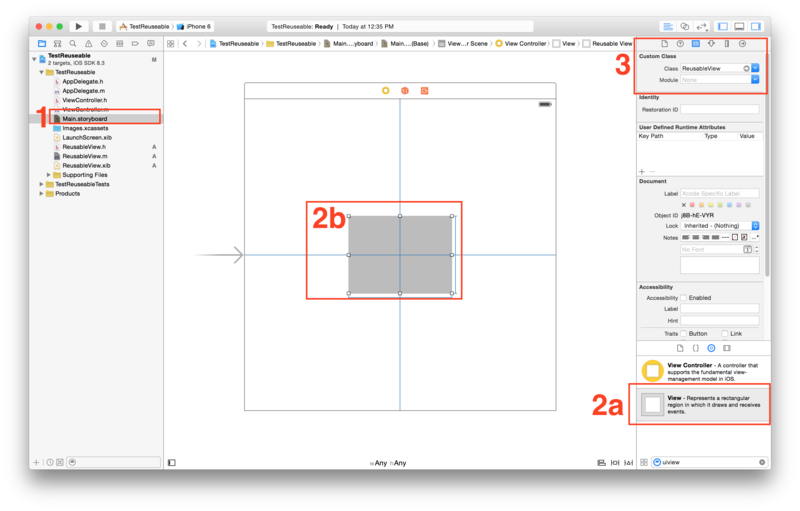 It even works with IBDesignable to render your custom view (including the subviews from the xib) at design time in the storyboard. 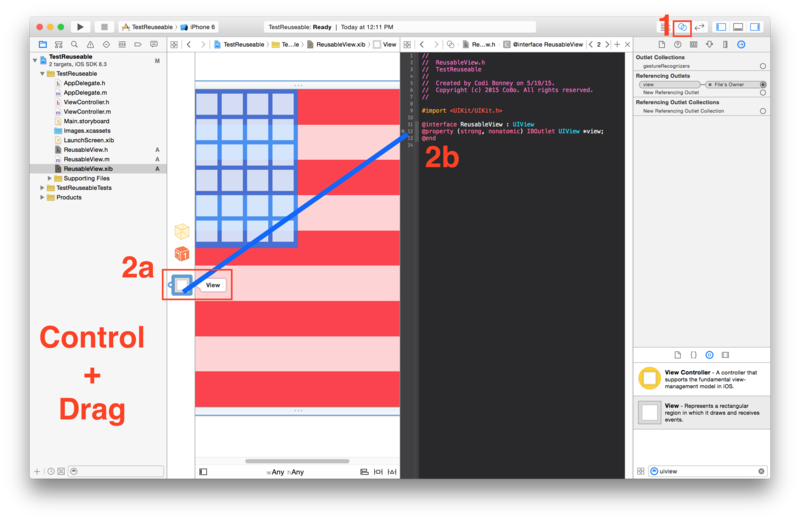 Just converting Swift to Objective-C isn't enough to make it work. I've had hard time to allow live rendering in Storyboard. 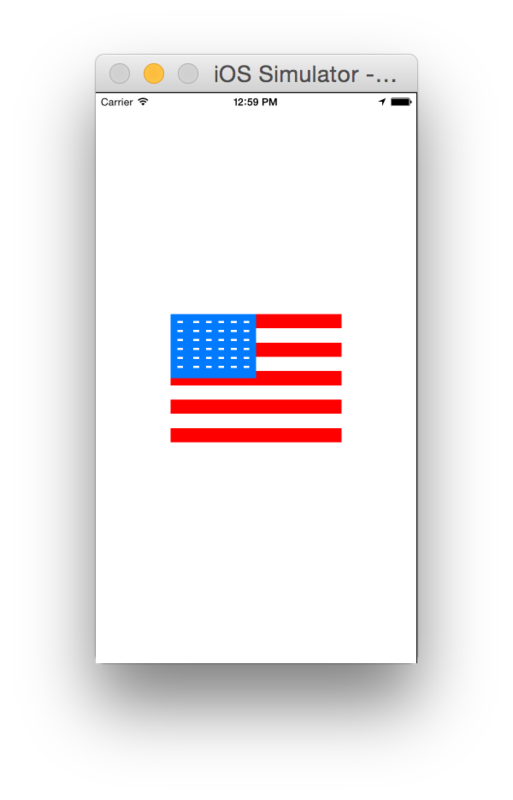 After translating the whole code, the view is well loaded when running on device (or simulator), but the live rendering in Storyboard doesn't work. The reason for this is that I used [NSBundle mainBundle] whereas Interface Builder hasn't got access to mainBundle. What you have to use instead is [NSBundle bundleForClass:self.classForCoder]. BOOM, live rendering works now ! Note : if you have having issues with Auto Layout, try disabling Safe Area Layout Guides in the Xib. Not the answer you're looking for? 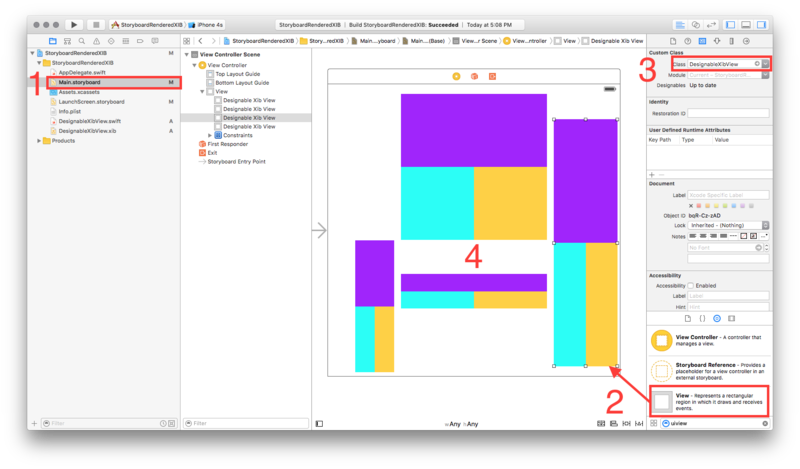 Browse other questions tagged uiview autolayout interface-builder uistoryboard xib . How do I create a custom iOS view class and instantiate multiple copies of it (in IB)? Do outlets limit reusability of classes? 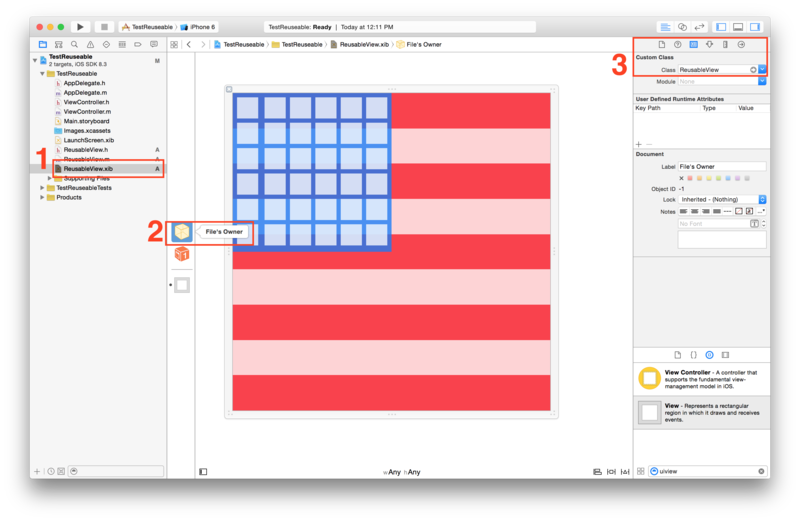 Is it possible to set UIView border properties from interface builder?